The Water Warriors Hornet is the smallest of the Water Warriors line. This blaster is roughly the same size as a Super Soaker Max-D 2000 and features comparable statistics and general performance. The Hornet uses a pressurized reservoir to push water from its nozzle. The pump pushes air into the reservoir to pressurize it. Interestingly, there is a gauge on the side of the blaster which allows the user to determine how much more pumping is required to fully pressurize the blaster. The gauge shows green when the blaster is at full pressure: a useful, handy feature. 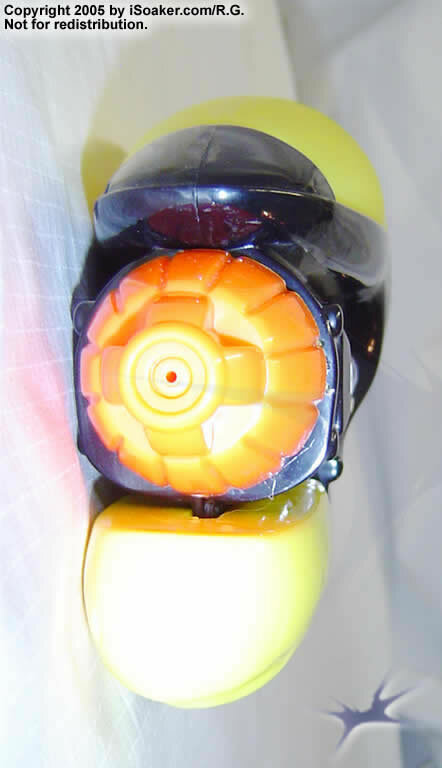 However, the blaster can nearly empty its entire reservoir's contents on a single sustained burst. The stream pushed out from the Hornet is good for a blaster this size. The reservoir, itself, holds a respectable amount of water. One minor complaint is that the water intake in the reservoir that feeds the nozzle is angled strangely upwards meaning that when water level is lower, one is more likely to produce mist shots instead of fully utilizing the reservoir's capacity. Thankfully, only about 30 to 40 mL of water remain in the reservoir due to the intake's geometry. On a plus size, the reservoir's cap is nicely tethered to prevent its loss. 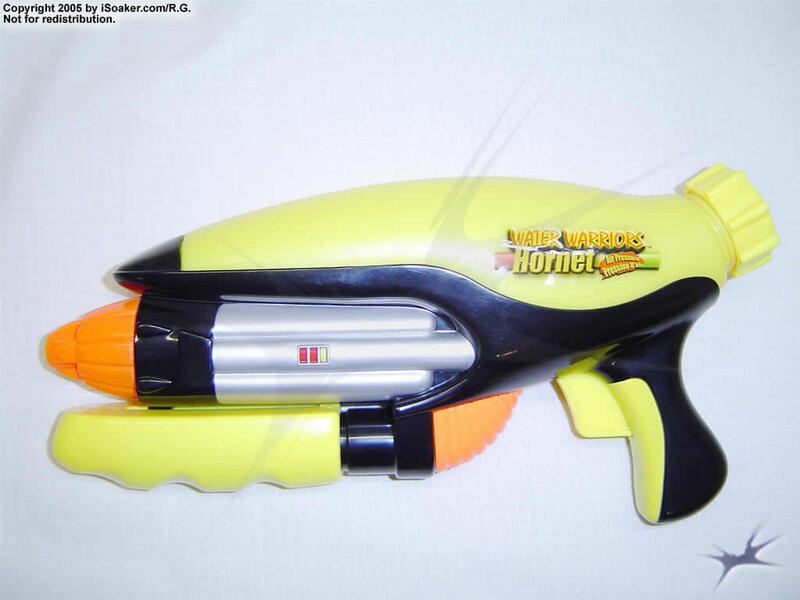 Pumping the Hornet is quick, though the pump stroke feels shorter than Super Soaker models. The pump, though, is tracked and feels quite sturdy. The trigger and handle area feels comfortable, though is a little on the small side for those with larger hands. Overall, the Water Warriors Hornet performs admirably for a blaster of its size. Add to that the added feature of a pressure gauge and slightly increased capacity and one ends up having a good small soaker perfect for back-up or for use in smaller skirmishes. Nice size, light, easy to carry. Despite its size, it packs respectable power. It also does not take too much effort to pump up the pressure chamber and has a pressure gauge for quick assessment of how much more pumping is needed. The tank provides a respectable amount of water. Easy to fill with a nice, tethered cap. This is a rather small blaster compared to the others out there. The trigger and grip area and grip is a little short, meaning that larger hands will not be able to have all fingers on the grip comfortably. Solid-coloured reservoir makes it more difficult to determine how much water remains. Pump stroke volume feels a little on the low side.